Don't these ripe and juicy berries look delicious and tempting? They are home grown and this year my in-laws had a huge bounty. We ate them in huge bowl fulls and I also made a lovely, very popular dessert with these. 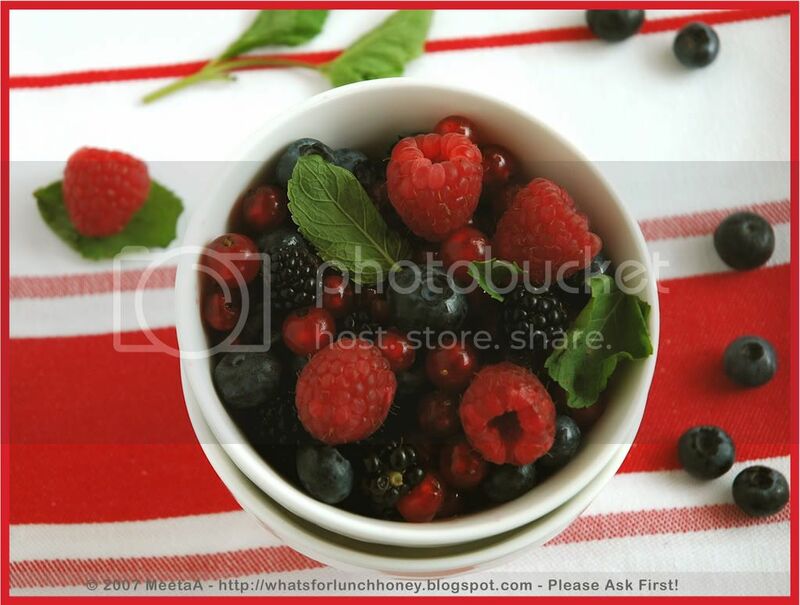 However, berries are very rarely used in the dessert! Care to take a guess? You could win yourself a little something from me again. I am ready to give away another one of my pictures to a lucky winner. The first one to leave the correct answer can choose their very own favorite picture taken by me. Pick out any photo you particularly like on my blog here or on my Flickr Phototstream and I will send you a small/medium sized poster (depending on the crop of the photo) of the original picture (without the frames, titles and copyright). You are welcome to leave multiple answers, but I'll pick the first one from the list ;-)! is it berry rice pudding or berry kheer? I know it sounds funny and outrageous, but could it be berry halwa??!! I will wait for your poster:-)!!!! BTW, I really enjoy your website. It is both thought provoking and informative. Also, wonderful recipes too!! Mmm. I got lucky last time, let me try again. Berry tiramisu? Dessert.. did u say? ok my guesses are payasam/kheer, halwa, creamy berry cake, berry ice cream, pannacota with berries..., berry semifredo..? I will wait for the poster ;) You are a genious photographer...I have no words beyond that. Lovely Pics. Well, you could put them into anything, hmm.... pannacotta, tiramisu, pudding?! Don't know what you made with them, but I know what I'd make with them -- nothing, because they wouldn't last long enough! I'd pop those beautiful berries right into my mouth! hi...I guess u used it in creme di mascarpone...or..berry mousse..or..berry muesli joghurt??? Well the first thing that came to mind was berry pudding, but since that's already guessed, I'm going to say ice cream. Or a hidden berry cake? How about Berry pie .? I am just guessing..will be waiting for the dessert. Now I am very curious to know. My bf's parents had a wonderful bounty of raspberries and right now I have so many blackberries in the backyard I don't know what to do with it all! Maybe a berry fruit tart? Berry muffins, maybe? They look totally luscious! wow blueberries ,went for gardening class on growing them,but never had to really plant few. beautiful bounty. I would have gone with berry tiramisu but that has already been guessed. I really love to take part in guessing games. Is it berry smoothie or a berry pie? delicious and tempting - you took the words right out of my mouth (or keyboard, in this case) for describing those beautiful berries!! bread and butter pudding with berries?? Although not traditional I would totally see these in a Black Forest Cake. Love the colors. And we have a winner! This time it took some time - which pleased me LOL! I will be revealing the winner AND the recipe in my next post! Stay tuned! Meeta have written there is a winner. But just for the fun i thought if i go it correct. Berry Triffle, but that would be incorrect as nobody have wrote in the comment. Then Berrt cheese cake. Well waiting to know in your next post the corect answer. Woo, I'm so late. So behind in my reading. Must skip a head to see the answer. I never seem to get much past putting berries like these into some greek yogurt. I guess I am late for this guess but it could be the mixed berry pie or the pie tart right? Duh!! u already have a winner. So dumb of me.